Have you ever seen a video online or listened to a recording of someone speaking where their speech was punctuated with what sounds like a gunshot? Whilst there are a number of reasons this might be happening, the most common is that they haven’t used a pop filter with their microphone and every time they say a word with a hard stop (like “crack”, “stop” or “bat”), the force of their voice hits the microphone head-on, causing that distinctive noise. Have no fear! We’ve scoured the market for the best pop filters around so that you can relax. We’ve found filters to fit every need and budget, so get your microphone set up how you like it – we have the feeling you’ll be using it soon. The table below shows the name of each pop filter we’ll be reviewing, as well as the type of microphone it’s intended for and the type of filter it is. 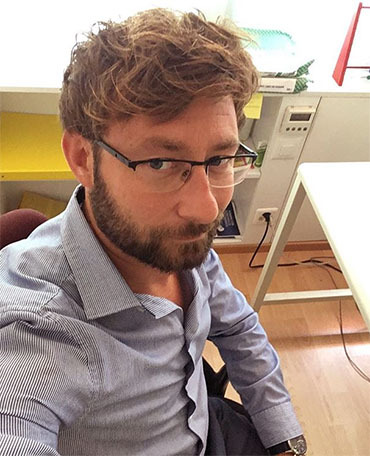 This is a brief overview, but just wait – the real meat of this article is yet to come. Now that you have a feel for the types of products we have in store, let’s take a closer look at each, evaluating their strengths and weaknesses as we go. The first in line is also the least expensive, the On Stage Foam Ball-Type Mic Windscreen. This pop filter is intended for use with a standard “karaoke style” microphone, so it won’t fit some of the larger, more popular models like the Blue Yeti, but it will absolutely make you easier to listen to after one drink too many. Its primary draw is its extremely low price point. Costing around 3 USD, this product is a very cost-effective way of getting the most from your low to mid-end microphone, and as an added bonus it comes in red or blue if the standard black doesn’t take your fancy. So, what exactly is a karaoke-style mic? Well, the manufacturers say that anything similar to a Shure SM58 will work. 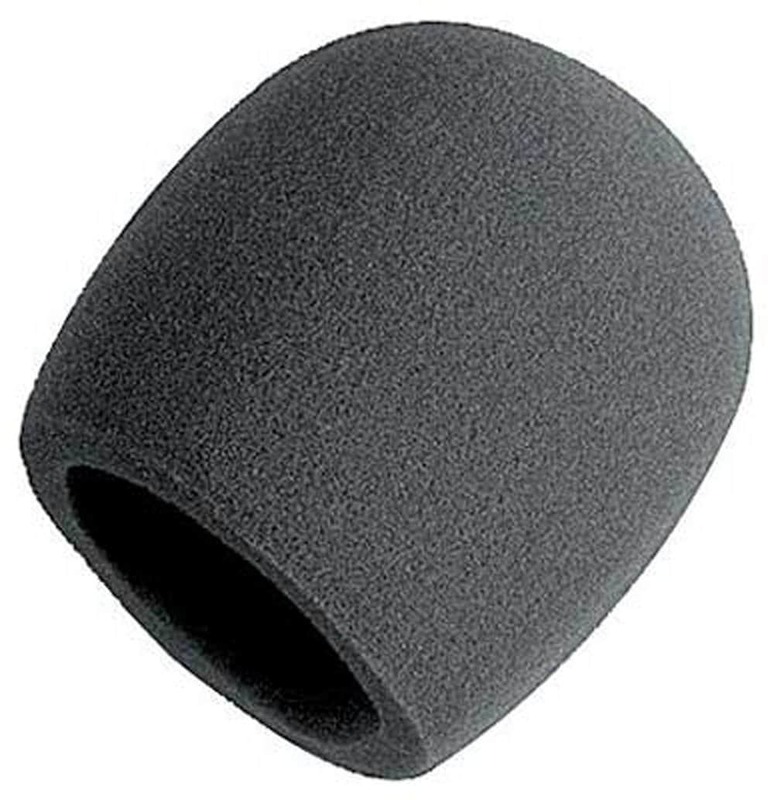 That particular model has dimensions of 10 x 4.9 x 3.3” but it’s worth noting that there is a pretty decent amount of elasticity to the foam that this product is made of, so even if your microphone is slightly larger, there’s a good chance it’ll fit. The shape of the filter is rounded but not particularly tight. This is likely to make it work with a wider range of products, but as a result, it tends to hang loosely at the base. This doesn’t have any effect on the quality of your audio but might look a little untidy, so if this kind of thing annoys you, you might be better with a more specialized filter. For most people, though, this will do the job nicely. Somewhat worryingly, this product was labeled as containing harmful materials, however, we’re pleased to say that when the manufacturer was queried about this, they revealed this to be a mistake. In fact, this is a pretty simple, medium density foam filter, so we’re not sure why this label was applied, but it’s nice to have some clarification. Despite its reasonable thickness, it has good airflow so you don’t have to raise your voice when speaking – it’ll hear you just fine if you use your normal voice. All things considered, this is one of the very best inexpensive pop filters around. 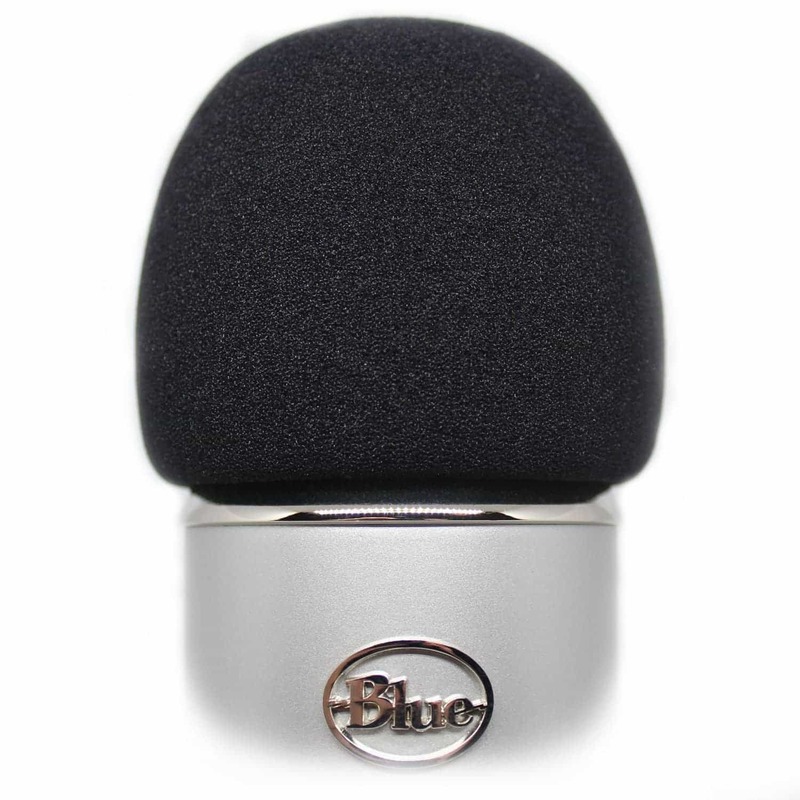 The choice of colours and stretchy material only add to its appeal and although professionals may find it a tad underwhelming, for people looking for a quick and easy improvement to their audio, the On Stage Foam Ball-Type Mic Windscreen will be a great investment. 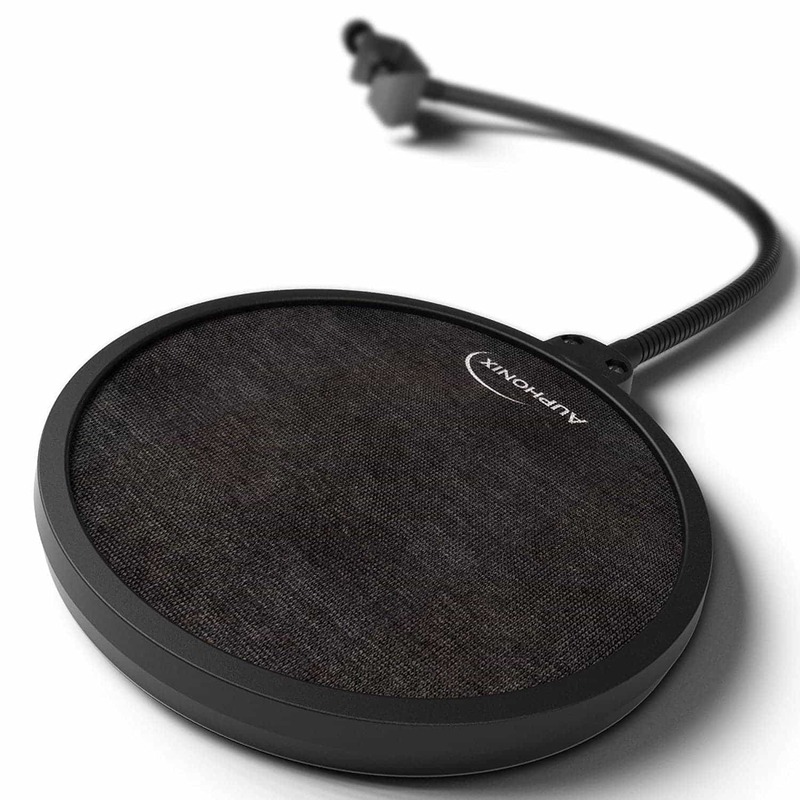 For people who prefer to stay in one place when they speak, the Dragonpad USA pop filter is perfect. It connects to a mic stand or tripod using an adjustable nut for the strongest grip and since it has such a large bolt, it can attach to just about anything as long as it’s 2” or less in diameter. The mount can be freely rotated around the mic stand and retightened to get the perfect angle, and thanks to the 13” flexible gooseneck connector, it can be bent or adjusted as needed. The filter itself can swivel 360° too in case your microphone is in an awkward position. 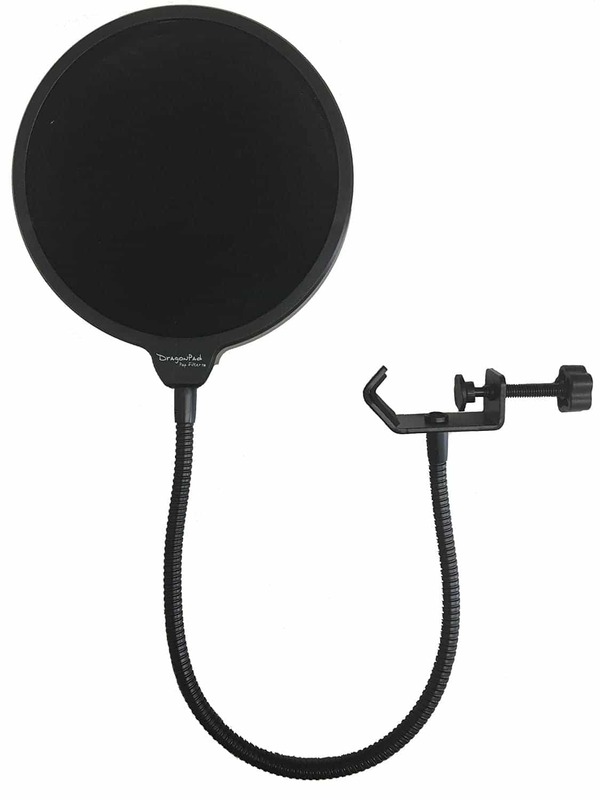 This pop filter has a screen diameter of 6” and is made of double layered stretchy nylon with a plastic outer ring. As such, it’s very light (weighing just 8 ounces) and relatively sturdy, although it does have trouble supporting the filter at certain angles. This filter works best when mounted above the mic and hanging down. It protects against not just forceful pronunciation but also any saliva expelled by that one person who always gets way too into their favorite song. 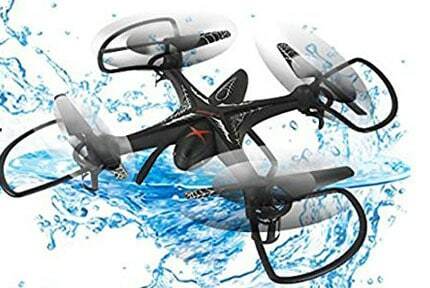 The other main draw of this product is its very low price. It’s more expensive than the last model we reviewed, but really, what isn’t? This one costs less than 10 USD and holds up very well. It doesn’t have any of the fancy bells and whistles that more expensive models do, but it gets the job done. Overall, this is a pretty basic pop filter, but despite this, it has a lot to offer. The wide attachment mechanism allows it to attach to a host of differently sized stands and tripods and the nylon does a great job at minimising popping noises in your audio. 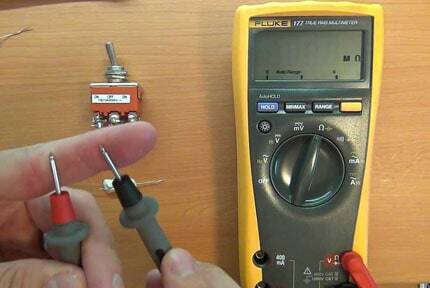 If you have a professional setup, you’ll likely want to spend a little more, but for general use, this will get the job done. 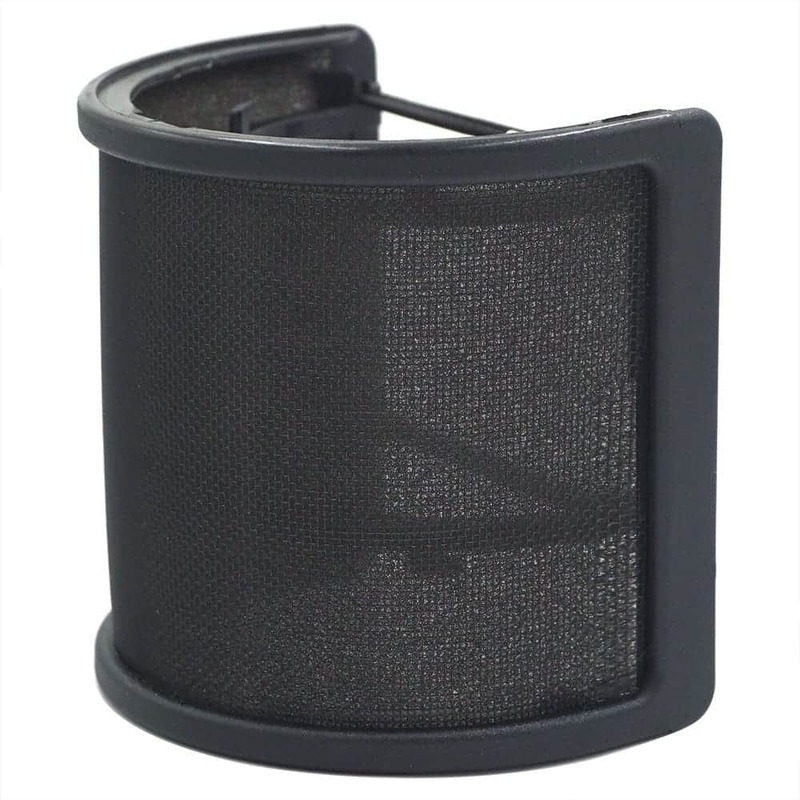 This pop filter looks a little different from the other two we’ve seen so far – the Sywon Metal Mesh Pop Filter has a windscreen style design for better vocal isolation, not only by reducing popping noise but also by filter out breathing sounds and environmental noise. It uses three separate layers for the best results. The first is made of the same foamy material that the On Stage above used, whilst the second is a metal mesh and the third is a light layer of cotton. Together, these remove everything that isn’t intentional from your finished audio and reduce the amount of post-processing work that needs to be done. This product attaches to your microphone using a combination of elastic bands and an inner rubber ring to create friction between it and the mic head. It has a nice, firm grip and doesn’t slip or fall off (assuming you attached it properly), plus since it’s adjustable, you can connect to any type of microphone as long as it has a diameter from 45mm to 68mm. Better still, it works on both traditionally shaped and condenser mics, although for larger products like the Blue Yeti, it’s a little small. This model is less than half the weight of the Dragonpad USA, weighing in at just 3.2 ounces, so it’s not only very useful but lightweight and highly portable too. So, for a highly efficient, lightweight, sturdy and versatile pop filter, you’d expect to pay top dollar, right? Well, surprisingly, this product only costs around 10 USD so it’s a very economical way to upgrade your recording setup. So it’s a very useful product, plus it’s cheap? What more could you want? If you have a limited budget and want the biggest bang for your buck, the Sywon Metal Mesh Pop Filter won’t disappoint. We’ve seen a couple of filters that are great but a little on the small side. The VocalBeat Foam Pop Filter is a larger model, specifically designed to fit onto those wider microphones that are so popular – namely the Yeti and the Yeti Pro. 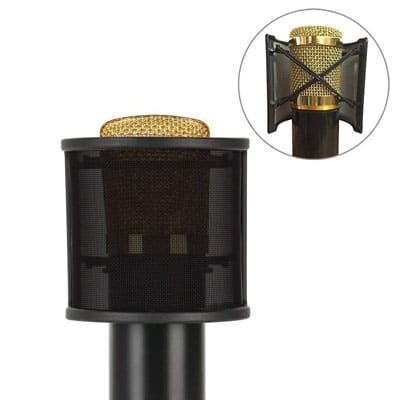 As well as these two, this product fits most other mics, all the way up to 2.5” in diameter. That’s a little smaller than the maximum supported size of the metal mesh filter above, but unlike that product, this one doesn’t need to be held on – it goes right over the top part and thanks to its tapered shape, stays on nice and tight. This is a very useful product since most similar filters are too small and have a tendency to tear when stretched too far. The filter itself is made of a high-quality foam which blocks out the harshest syllables whilst letting the softer notes through. It might be a little disheveled on arrival, but once it’s out of the box for a day or two it should start to regain its original shape. The upside of this material is that it’s very lightweight – just 0.6 ounces; you can throw it into your kit bag and not even feel it. Now, we’re aware that this product is a little pricier than the others we’ve covered so far – it retails for around 13 USD and that might seem like a lot for a piece of foam, but VocalBeat are so confident that they provide a 36-month money back guarantee. If you’re not happy with it, you have three years to return it – no harm, no foul, no questions asked. If that doesn’t tempt you, maybe the fact that it comes in three colours (grey, black or a particularly striking shade of blue) will. If you can look past its slightly higher price tag, you’ll find that there’s a lot to like about this product. It does everything you’d expect it to – blocks unwanted noises and covers just about any mic you’ll ever use. The money back guarantee sets it apart from its competition and if that doesn’t convince you, very little will. For large microphones, you need the VocalBeat. Now, this is the most expensive pop filter in this list, and at first glance, it might seem pretty similar to the others. Give it a chance, though, and you’ll notice that it has a much sturdier, higher quality construction that goes some way towards justifying its slightly higher price tag. This model uses a 6” double layer of mesh to minimise the impact of any plosive sound it encounters and features a gooseneck style holder that is both sturdy and flexible. It provides enough tension to support the filter regardless of position and clamps directly to your boom arm or microphone stand, plus a variant which comes with a flat surface clamp is available. When you purchase this model, you don’t just get a pop filter. You also get access to a bonus ebook which is packed full of recording tips that would be invaluable to the novice user, and as an added bonus, Auphonix includes a 12-month money back guarantee so that if anything should go wrong, you won’t be left out of pocket. With a retail price of around 19 USD, it’s not a huge investment, but it’s still nice to have that safety net, don’t you think? A lot of people will settle for the least expensive filter, and that might even be the best choice for them, depending on their needs, but for those with higher goals in mind, the Auphonix Premium Audio filter is the best you can get without a significantly higher price point. Pop filters are a pretty simple product, and it’s easy to think that they’re all the same. Scratch the surface, though, and you’ll come to realize that there is as much depth to them as there is to the microphones themselves. We’ve put together a short guide to advise you on a few important things to look out for before you spend any money on one. Consider how you plan to use your microphone. Whilst singers will definitely benefit from them, they can likely get by with a less expensive model (for a while, at least), whereas people who’d use their microphone for speech are more likely to see better results from a higher-end filter. This is because plosive sounds are much more common in everyday conversation – if this sounds like you, we’d recommend a product with at least two layers. The more layers your filter has, the more pronounced the dampening effect of the filter. This might mean that you have to speak or sing a little louder, but the difference between a single and multi-layer pop filter is easily noticeable. The type of filter you can use is dictated by a couple of features. Namely, the shape of your microphone and the kind of setup you have. Even the largest microphones can have a filter which attaches to the stand, although some depend on a particular microphone diameter or shape. Make sure you take a bit of time to measure your microphone, especially if you’re planning on buying one of the foam cover style filters. Ultimately, there are loads of different kinds of filters available, and choosing the best pop filter for vocals is different from choosing one for podcasts – which is best is entirely dependent on your needs. If you’re interested in finding out more about some of the different styles, there’s a great little guide here which goes into it more fully. There’s a pop filter for everyone in this list, but we do have to pick one which is the best overall. It was a difficult decision, but we’ve decided that the Sywon Metal Mesh Pop Filter comes out on top this time. It’s an incredibly versatile little pop filter that fits just about anything and uses a three-layered system to produce the clearest results. We hope that this article has been useful, and if so, we’d like to ask you to leave a rating or a comment. Every piece of feedback we receive helps us tailor our content to suit you, so we’d really appreciate it. Thanks for taking the time to read this and have a great day. Now that you’ve read about the best pop filters, take time to read our guide about the best android TV box. This guide will help you. Read it right here.